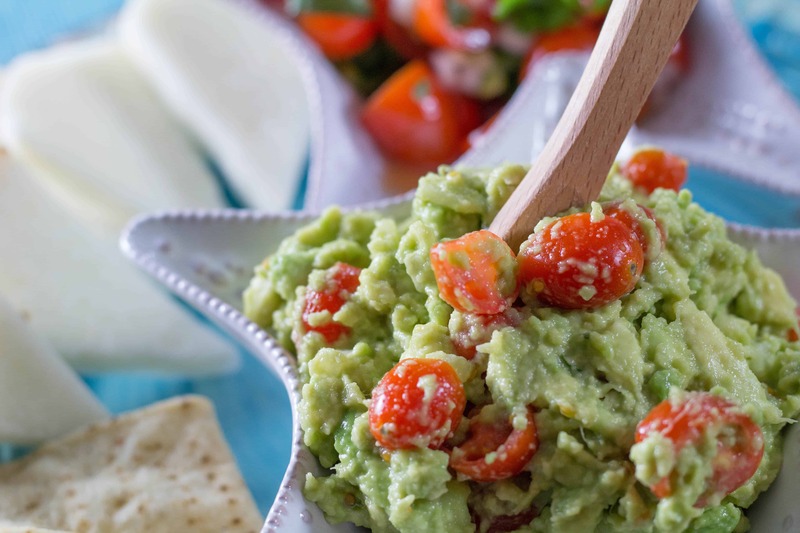 I’m so in love with this guacamole recipe. One of my coworkers gave me a version of it a long time ago and I’ve loved it ever since. The secret ingredient is sherry! One taste and you’ll agree! If I’m just making this for me, I do this recipe, otherwise I’m tempted to eat more. If I have guests, I make a double batch. The guacamole is also great in my Chipotle Fish Tacos. 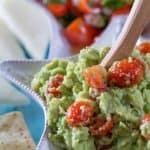 Luscious guacamole! You’ll love this recipe! The secret ingredient is sherry, which makes it rich and creamy. One bite and you’ll be hooked! You can prep the onions, jalapeños, garlic, tomatoes and have them all ready to go but don’t make the guacamole until ready to serve. Cut the avocado in half and scoop it out into a small bowl. Place the pit in the bowl as well (this helps to keep the guacamole from turning brown so fast. Add the remaining ingredients and mash with a fork. No Replies to "To Die For Guacamole"